For those that have a ready supply of logs, log boilers can be a fantastic substitution for traditional fossil fuel boilers. They are loaded each day for a one off burn so the heat can be used throughout the course of the day. Log gasification boilers work on a slightly different principle to the wood chip and wood pellet boilers. They operate on the principle of one fast and furious firing, which heats an accumulator tank or thermal store. This ensures maximum efficiency of the system without having to keep the boiler ticking over at a kindling rate, which is not very efficient. Using an accumulator tank is a good way of storing the heat generated from the boiler, which in turn reduces the number of times it needs to be fired. The other main benefit, as with all other types of biomass, is using an accumulator tank to reduce the firing of the boiler during periods where low heat loads are required, such as during the summer months when it may be required for just heating water. The combination of this type of boiler and a solar thermal system can provide a good alternative to using an immersion heater during the summer. These boilers should not be confused with log stoves with back boilers and can offer very high efficiencies of around 90% through the gasification of the wood during the firing of the boiler. Different models of log boilers take different sizes of logs, typically from 0.5m to 1m in length. 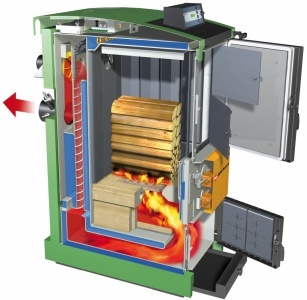 The size of log boilers is typical around the 20-40kW range. See our range of log gasification boilers here.